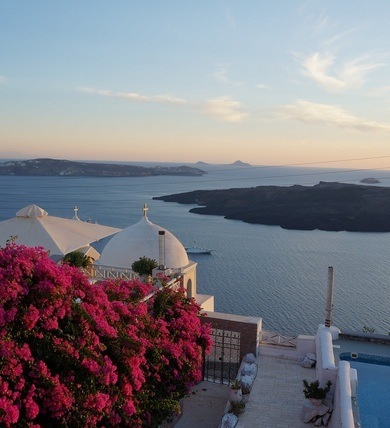 No doubt the most visually stunning and dramatic Greek island, Santorini is at both elegant and charming. Voted as the world’s best island for 2011 by the readers of Travel & Leisure, this Cycladic Island offers one of the Aegean’s most unusual landscapes. 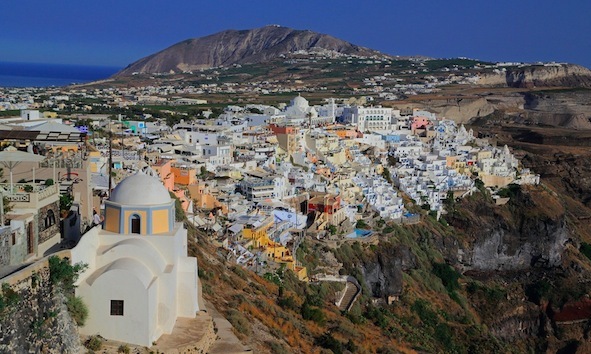 The island’s official name is Thira, although the medieval name – a corruption of “St. Irene”, left behind by the Italians – is most commonly used today. 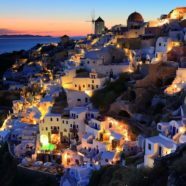 With its unique blend of sulphur, salt and water, 120 miles southwest of mainland Greece, Santorini is the world’s largest inhabited caldera (a cauldron-like feature from the collapse of land following a volcanic eruption.) 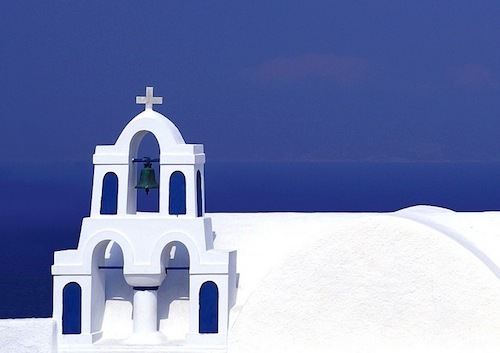 Thirty-six varieties of grape grow in the rich volcanic soil from which Santorini produces delightful white. 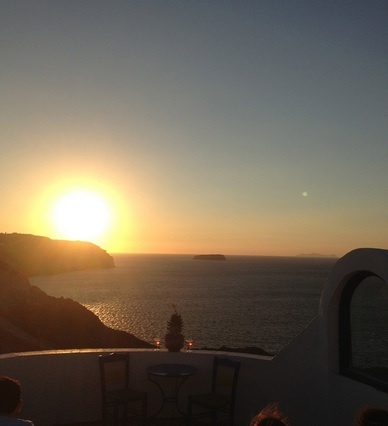 One of the highlights is the family-run boutique hotel set on picturesque cliffs with direct panoramic views of Fira’s stunning caldera, a unique haven for you tucked away from the bustle of the town center. Surprisingly quiet and luxuriously private, this historical building, dated to the 1830s, is a great base from which to explore the island and is only a 2 minute walk from Fira centre with its bustling lanes and eateries. All four en-suite rooms offer original architectural features and are light and air-conditioned. Lovely restored, they are furnished with antiques and family heirlooms for that personal touch, not forgetting elegant, modern fittings and luxury bedding for the discerning traveller. 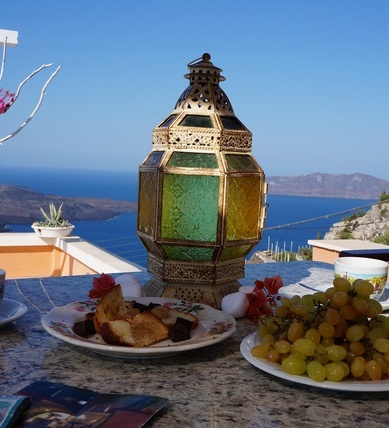 Looking out to sea, the private rooftop terrace is only one of the several open spaces where guests can enjoy a healthy homemade breakfast and cups of freshly brewed Greek coffee.